If you have been following this blog, you know that it has been a long time since I’ve run a race … 7 months, to be exact. 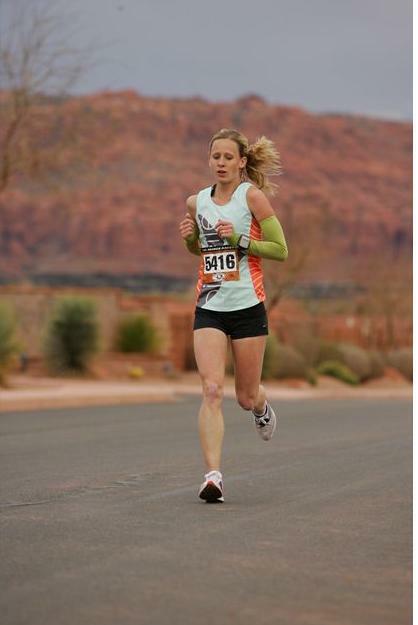 My last race was the St. George Marathon back in October. A lot has happened since then. It hasn’t been that I haven’t wanted to; life has just happened … oh, that and WINTER. I got a lot of running done this winter, but there really aren’t all that many races going on in northern Utah during those months, and I am not at the point in my married/mothering life to justify travelling for a race. Also, there is another (little) reason why I have been laying low, and that (little) reason is because we are expecting another baby! I am 22 weeks along, due the end of September and we are so excited to be adding another boy to the family! This time around has been a lot better than last time. We feel very blessed. If you know me, though, pregnancy has never been a reason for me to stop running. I have run through all 5 of my pregnancies, and have found that I have felt great, my deliveries (so far) have been so easy and recovery has been so fast. I actually found out we were expecting our first child in the middle of my last cross country season at SUU. I raced until 12 weeks, and even got faster. Imagine that?! Here is a blog I did when I was expecting our 5th, about being a pregnant runner. 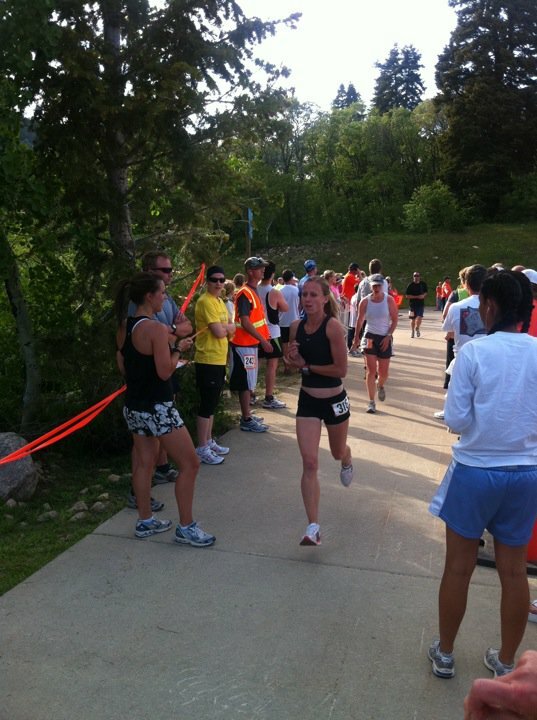 A few weeks back, my husband and I were asked to pace the Utah Valley 1/2, this coming June 8. When we were asked, I really just wanted to do it so badly, especially going with Adam. He was asked to do the 1:35 pace and me the 1:45 slot. It is a downhill race (not too bad of a downhill, though). I really wanted to get a run in at that pace or faster, at least 2 weeks before, so that I could feel comfortable about pacing the race. When I heard about a new race in our area, called the Alpine Classic 1/2, I thought that this would be the perfect one to sign up for. I looked over the course and saw that it had some pretty steep uphills with an overall 345 foot gain in elevation. Course map here. I love hills and thought that it would be so much fun. I figured that if I was able to keep a solid and easy 8 minute pace for a tough course, that the downhill one would be nothing. When I got to the race, I saw the man who is in charge of my pacing team, Jonathan at the start. He told me that I should win the race, and I told him that I wasn’t planning on it because I was pregnant. He gave me a good vote of confidence, though, which was much appreciated. I still had no intentions of doing anything but running my 1:45. Funny side note: I was standing in the port-a-potty line, when a lady turned to me and said “look at all the runner bling!” She was referring to all the flashy shoes, compression socks, bright-colored clothes the people had on. She then said, you can tell the fast ones by how nice their shoes are. Feeling a little self-conscious, I looked down at my red and white adidas manas, that I got for $35 on clearance on Zappos, that I have run 4 marathons and countless halves in. They are beat up to who knows what level. She then looked at them, and we had an awkward moment … followed by another one, when I had to go in the port-a-potty after her. I was about to say “you know how nervous a person is by how smelly … ” … just kidding :). Anyway, so at the start, I didn’t line up at the front; I just stayed a little in the middle of the pack. It wasn’t a huge race, by any means, but I did not want to be the pregnant lady at the front. When I started out, I saw two girls go out fast. Instinctively, I wanted to go out with them, but then I remembered what I was there for, and it was not to go out fast. Because I am expecting, I wanted to make sure that I kept that in mind, and pay attention to my body. So, I stayed a good distance behind them and just kept my pace at about a 7:30-7:45 and felt really comfortable. I passed the first girl at about mile 2. The other girl who was in front of me had on bright pink clothes from her head down to her shoes, so it was really easy to keep track of her. At about mile 6 or 7, there was a really steep climb (one of many). I saw that she was struggling, and so I decided that I would pass her. At about mile 8, the photographer passed me on his 4-wheeler. He asked if I was expecting (yes, he did :)). I told him that I was, and that I was expecting my 6th. He then rode beside me for a little while, snapping away. The driver even told him that he needed to get a shot of my shadow … I agree it’s probably my best feature ;). I’m excited to see the pictures! And best of all, they are free! I will post them when I get them. 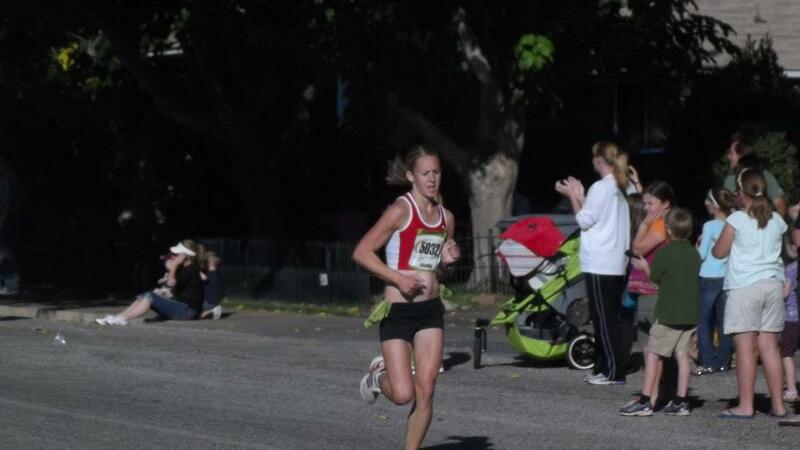 From then, on I coasted in, finishing 2nd overall and first place female with a time of 1:33.47. –Not a spectacular time, but for a hilly course and being pregnant, I’ll take it! Results here. It was a great race that I will for sure put on the calendar for next year! This entry was posted in born to run, exercise, family exercise, health, running, Uncategorized, winter running and tagged adidas mana, alpine classic 1/2, running pregnant, St. George Marathon. Bookmark the permalink. Congrats, that is great news for you and your family! I look pregnant when I run too but that’s just because I eat too many cupcakes…maybe I should lose that and try to beat your pregnant half marathon times, let’s be honest, I am not beating your regular times. Hi! Thank you! St. George is a great course! It isn’t one of your crazy downhill ones (although people like to say it is). It is a really fair course. As far as training goes, I would just make sure that you have a really good base of mileage first. Then start to add in tempo runs a couple of times a week and do hills. Hills are what have made me stronger in my running/racing. Make sure that on your long runs, especially, to train with water and fuel. This way, you know when your body needs it and what it can handle. On race day, it is important to know your pace and not deviate from it, especially at the beginning. Believe me, with all of the race day factors, a 6 min mile will feel slow, but if you do that, you will be sorry. Umm… there is so much! If you want to read my recap of the St. George Marathon from last year, just scroll down to it. It has a lot of good info. Good luck! I will be running it in 2014 for sure! The race directors deferred my entry until then, only if I named the baby “George” ;). It might be a good nick name :).